Last year I posted a $100 Holiday Gift Challenge which was easier than it sounds, because we had already discussed with some family the year before to not exchange gifts. I say some because some family members thought this was a great idea, while others responded as if I’d suggested throwing the kids into the bear pit. Either way, we winnowed down our gift list. I was able to get through the holiday spending less than $100 for everyone, although the task was harder than anticipated due to a freak two week snowstorm which essentially shut down the city and kept the kids at home during what should have been primo gift shopping time. Non-members of The Compact (buy nothing new) dealt with the storm by finishing up their holiday shopping online, but that’s not exactly an easy task when trying to glean the local Goodwill for one’s gift giving needs. I plan on repeating the $100 holiday gift challenge, and have hopefully learned my lesson on early preparedness. You may ask why I’m bringing this up on October 4th, not exactly prime holiday shopping season? Scaling back on gift giving is not only an act of frugality, but is also a way to bring meaning and enjoyment back into the holiday season. I know I can easily get caught up in trying to find the perfect gift for everyone, which can become quite stressful. So, are you in? 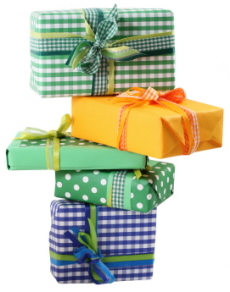 Is scaling back holiday gift giving something appeals to you? Are you willing to start that conversation with friends and family? I’m in! This is actually one of the things I’ve been most looking forward to in my Buy Nothing New Year. I have found in the past that the most meaningful gifts were not necessarily the most expensive, and that goes for gifts I’ve received as well as the ones I’ve given. I just started writing down my rough ideas, because I think the biggest challenge will be the planning, as you say. I’m planning on a lot of DIY this year, and so far have baskets planned for most people- homemade granola, rosemary jelly, pumpkin bread, egg nog (! ), trail mix, and shortbread cookies. One thing I’ve come up with that I’m excited about is putting together a “workout” for my brother who had to cut his gym membership: I’m going to buy a jumprope, and then cut out exercises from a magazine with pretty models and paste them on flash cards- then he picks 5 upper body cards and 5 lower body cards. It will be a simple 30 minute workout, with a CD of upbeat music he likes. For my husband, I’m going to come home with a blue streak in my hair. He’s always trying to get me to do something like that, but I’m more conservative than he is about that kind of thing. I think the $100 challenge will be fun! Angela, LOL. Loving your ideas, especially the blue streak! My family and my husband’s family have already begun scaling back as we’ve add another generation to the bunch. We’ve had great success buying gifts throughout the year for birthday and other celebrations but this is the first Christmas that we will be “Compacting”. Creativity and DIY will play a big part in our gifts as well. Can we keep it under $100? I don’t know, but it’s certainly something to think about. gonna try – we’re into 4th month of unemployment – looks like my husband will be employed by the end of the month but that means alot of catch up. i’m def going to raid my gift closet and recycle. yeah, i know some people think it’s tacky but perfectly good gifts just sitting there unused. could you please link us to last year’s comments to see what everyone did? BTW, I think THE most worst birthday belongs to my son who had the misfortune (baaaaaad planning on my part) to have his birthday on the 26th of December. Don’t think he has ever forgiven me! I think this is an incredibly worthwhile challenge. But as you said, little late for me now. Definitely something to think about for next year. (I am learning much reading your blog!) I decided last January that I wanted to make presents for the 4 important people in my life (my husband, my two sons and one DIL). And I wanted to do something that I have great fun at – knitting and quilting. So I have been making presents all year. (I did this purposely because I know that I am a bit slow. I so admire people who start now!) I shopped at local shops for the material and yarn. That is about all I can say in my defense. But spent more than $100! But had a great time making the quilts and scarves. We save $40 each month to spend at Christmas time. This covers our immediate family, our parents, my husband’s siblings, two of mine (my sibs do a name drawing), and my husband’s grandmother. Oh, and a niece on my husband’s side. I have 6 nieces and nephews on my side, but when you add in our four, that’s too many children to buy for, so we don’t exchange gifts for the kids. I do end up making a fair number of presents, and I’ve bought quite a bit of stuff at Goodwill over the year to give to our kids at Christmas. I am in with hubby and son and my side of the family, but unfortunately hubby’s side wouldn’t understand (OMG if I gave them something from a thrift store!). Hubby has been laid off for 48 weeks now (augh) so I think they finally realize that Christmas will be much smaller. Hubby and I only get a little something for each other (like $15) and we get a family type gift as well as Santa gifts for son (always a shirt (avg $5) and 2 small things). last year the family gift was a $40 dvd player for us since ours had died. for my side we only buy gc for my mom for groceries or restaraunts since she is 81. I have a large family and we stopped exchanging gifts years ago. I usually give things I’ve made/canned, etc. like canned jams, pickles, quilted table runners…things like that. I know I can’t keep it under $100, but I will get as close as I can. We started this a couple of years ago so keeping it below $100 should be no problem. And no, it’s not too early to begin discussing holidays with family. Our local dollar store already has their Christmas stuff on display….though Halloween hasn’t even arrived yet! Katy, I would love to see a list of how you spent your $100 last year, just to see how you chose to do it. My preference is to give experiences rather than “stuff” but that’s not always the most economical choice. I also like to give my parents and my aunt a nice gift, since they do significant amounts of babysitting for me during the year – maybe I could do a “gift card” for chores or something? I do buy some used things, since my family doesn’t care about that and – last year my grown up daughter’s main gift was nice glassware for her new apartment, all used, all cheap! I am having a Dirty Santa game non-consumer style. Everyone has to bring something from their house they no longer want, a DIY project, or a really cool $10 thrift/consignment find. I have some framed posters that I am going to try to get rid of finally! This along with my first annual tacky sweater party! And there just is no better place to find a tacky sweater than the thrift store. I just read the book 100 Dollar Holiday (from my libary system), and was really dissapointed in it. I love the concept, but I feel the writer just didn’t articulate it well. The last couple Christmases we’ve stopped giving gifts altogether, so I think it’s fair to say we can’t scale back any further on that. I know some may thing it very Scroogey, but it’s been really good for us — and not just financially. To be clear, it was something we talked about with friends and family beforehand since we wanted it to be mutual. We were happily surprised to find them all very relieved and not at all upset. I have a feeling we’re not easy to shop for and we’re not the only ones trying to save money. Not giving gifts meant that we also didn’t have to worry about what others may or may not want. No more juggling lists and worrying about “being fair” to each person and wondering if they already had this or that. On the other hand, we didn’t have to worry about returning gifts we didn’t want! And we are super picky now that we’re very minimalist at home. The big plus was that we got to avoid the mall during the holiday season and have more time to spend on other things. In fact, the busiest shopping day of the year we were headed in the opposite direction as the traffic. My husband and I spent a glorious day at a local historical farm instead of rushing around stores. Plus, we had more time to spend with friends and family, too, which I’m sure they appreciated more than anything we could have brought them. Last year I instated a 3 gift limit per child the adults in my immediate family swap names at Thanksgiving. My husbands family usually receive a box with local seasonal products like pecans and Satsumas( mandarins) or a framed photo of the kids. For the cousins I try to do a group gift like a board game. My kids were receiving entirely too many gifts and even at a 3 gift limit that is still usually around 12 or 15 gifts per child (these are from us and grandparents which we happen to have a more than usual amount). That’s a lot of of gifts. My husband and I generally get each other one gift usually a hardback edition of a book we want this year he has asked for Plato’s compendium. I need an immersion blender my 15 year old one died not to long ago. I try to stay Compacty and not buy new or buy consumables but the kids often get a couple new items. I am on the hunt for a globe for my 5 year old! I’m in! I always make all my gifts. However, it’s easier for me since I’m a teenager, so I’m not as obligated to have as lovely of gifts for everyone. Still, I’ve already got knitting and sewing projects started as holiday gifts for people, and I’m making gifts during clay, too. Framed pictures (frames from thrift stores, of course, then decorated by me) are common gifts, too. Does it appeal to me? Yes, both for me and for other people. Holidays can still, and easily, be a time of joy and sharing without spending unnecessarily large amounts of money. People tend to think of the holidays in a materialistic way, me included, which I resent. Presents make it seem like the holidays and are, as a generous act, important, but it doesn’t mean that a lot of money has to be spent so that aunt so and so gets big enough a gift, because remember all those things she gave us last year? Handmade and thrift store gifts can be just as precious. Happy holidays (in advance) and holiday gift planning, everyone! First of all, Katy, My birthday is 7 January, so I can commiserate with your thoughts. Everyone is broke or under the weather then–you have to really be a hearty soul to survive early Jan birthdays! I have encouraged our kids to donate time to charity, such as our local wildlife organization, or to soup kitchens etc, because none of us needs any more stuff! We go to a post-Christmas party every year that is really fun. Everyone has to bring a white elephant and put it in a pile in the middle of the room. Numbers are given out and each of us goes up to pick one of these lovely “treasures”, most of which look like thrift store rejects. (Not at all like the stuff all of us here fine in our wonderful Goodwills!) Then a lot of trading and bartering goes on to try to get something “good” away from someone else. This party is such fun after all the materialism of the season. For the last twenty years or so, my extended family has done a Christmas exchange draw. Those who are interested put their names in the hat and we buy ONE present and receive ONE present with a value maximum of twenty dollars. Then I know I only have to buy for my ONE cousin or neice or aunt or uncle as the case may be and it is all good, no guilt about missing anyone or having to buy for all when you can’t afford it. Since we all agree, it’s quite fun and then we get a present from someone we wouldn’t normally expect to get one from. This has been a great solution for our family. A few years ago I suggested only buying presents for the children in the family, no adults. Holy Cow!That did not go over. I also got them to draw names another year. Also did not go over well. Part of the problem is that I have no children while my siblings do, now their children have children. They buy one present for me while I’m expected to buy each person a present. Some of them I only see once or twice a year, or less. I love giving gifts, but I hate the generic “didn’t know what to give you” kind of gift. I’m also on a very tight budget. None of us can afford this gift giving frenzy. I also dislike the constant, “What do you want for Christmas?” questions that pop up this time of year and continue until Christmas day. I REALLY don’t need more stuff in my life and the items I really do want/need are usually to expensive (there is a reason they are still on the want list!). The last couple of years I have simply bought each family a gift and a small present for each underage child. This year I have made brandied pears and almond pears for the adult portion of the family gift. I had to buy the pears, jars, etc. to make them but still came in at slightly less than $5 a jar. These were a big hit when I made them a few years ago and people are already looking forward to this Christmas. I am hoping to come up with some inexpensive and/or homemade ideas for the kids, and the time to get them done! I used to give each sibling’s family a Christmas ornament for their tree but now everyone has tons of them or they don’t have a tree anymore. My sister Jan has a shop that sells European Christmas ornaments, so that idea went bust! Since I live in Canada and shipping is way too complicated, I don’t send stuff anymore. We are all well established and have all we need. This year, as in recent years, our kids are going to get handmade gifts. (I may help the ones in the States with a little cash if I have it myself.) I’ve knit things or given them icons I made, but this year I think I’m going to pick up thrift store t-shirts and tie-dye them with a Christian theme (works for all but one of the kids – his will probably be plain tie-dye, if there is such a thing.) So I’m looking up tie-dye/batik methods soon. P.S. Katy – is the illustration at the head of the blog post of recycled gift wrap? I never wrap anything anymore except in fabric, which I reclaim if I can! I’m in, my husband not so much. I started two years ago when my then 14 year old went on a rant about how much she hated the gifts we got her every year. It was a low blood sugar moment, but it made me pretty sad that she had no appreciation for the things she has in her life. So I decided that we would give gifts to people who would appreciate them instead. That began our year of charitable gift giving. Family members got NO gifts, except we had one “coupon night” where we exchanged coupons for things like back rubs and doing chores for each other, and one “make it” night where we did family crafts to give to each other. On the other nights of Hanukkah, we did charitable things–donated food to a foodbank, purchased “Giving Tree” gifts for disadvantaged children, selected books to donate to Reach Out and Read, and one night, the 14 year old and I prepared dinner for the residents of a battered women and children’s shelter. My husband was appalled that we were “cheating” our kids of gifts, especially the younger one who had not complained, but both kids actually said that it meant a lot to them, and elected to do a modified version last year. This year our finances are extremely tight, and I think we are going to do something else creative for the eight nights of Hanukkah–maybe celebrate each night with a special and fun food. We will still do at least three donations–the food bank, Reach out and Read, and the Giving Tree. For the food bank, we plan a “meal” for four to the extent possible with canned and packaged goods and shop for all kinds of goodies to enhance the meal. Last year as we were driving home from purchasing the Giving Tree gifts (I had a 6 month old baby to buy for) my grumpy teen asked why I bothered “since that baby won’t even know he got a gift”. I explained what it probably meant to his mother, who was not able to afford gifts on her own for her child, to have something to give her baby on Christmas morning. She was silent the rest of the way home, but later that evening was when she admitted that she felt really good about our “new” approach to gifts during the giving season. As for DH, he still feels guilty that our kids don’t receive gifts (one has a November birthday, the other December, so they aren’t really suffering). So later in the year, he buys a big family gift. The kids got a Wii last March. I was OK with it because it was not really tied to the holiday season, and we all have enjoyed it immensely. I am totally in on this one! I think that Christmas giving has gotten way out of hand. My brothers and sister and I have all decided that we will only buy for the children and our parents so that cuts down on some. My husband is an only child but, he has a close friend that is considered a brother and we buy for them. I am considering asking them not to buy us any gifts and just buying for their kids. I know that they will put a fuss up since we don’t have children yet (expecting our first! ), but I really don’t know what to buy them and it is a bit expensive. During the annual Christmas dinner held at my house last year I started what I hope may become a tradition. I wore my pajamas, housecoat, and fuzzy houseshoes. Minus the piles of useless gifts, it reminded me of being a kid again. Not to mention that I was more comfortable while partaking of all the Christmas food goodies. I just wanted to say I love this blog! So many so called frugal living websites are really just advertising how to get deals on the stuff we buy. Nice to see others are trying to get away from the stuff. For Christmas this year we are going to do handmade for a few like minded souls, one “wow” gift for each kid plus some handmade things, and perishables for everyone else. I doubt we’ll keep it under $100 though. One thing we’re considering on my husband’s side is suggesting we all spend a day skiing together or going to a theater show in lieu of a gift exchange. One problem we have is a dear family we’ve always exchanged gifts with. Last year I broached the subject of not exchanging gifts and they were mortified. Turns out they had bought our gift already…a $100 coffee machine that requires disposable coffee thingies! Once I got over the initial shock, we accepted it graciously, then found a reusable filter for the thing. This year I think we need to have a very direct discussion with them early!!! My fiancÃ© and I decided last year on our first one year anniversary that in lieu of buying gifts for each other (which are even more difficult as they are meant to be somewhat romantic) we would get something framed. The first thing to be framed was a Monet print we bought on our overseas holiday. It was fun going to the framing shop and picking the coloured boarding and the frame. We paid for it together ($300) and then celebrated when we picked it up a month later. Weâ€™re already talking about next year. The best part is to think that one day on our diamond anniversary our house will have 60 prints in it! A gallery of our life. Perhaps another couple can use this idea for Christmas time. ps last year we didnâ€™t exchange xmas gifts because our holiday together was enough. What a great initiative! I come from the Netherlands. Every time I read about Christmas being celebrated in the USA, I feel so alienated. I watched “Billy reverend and the church of stop shopping” last year and was shocked to find out that some people are in debt for months after this holiday. I can’t believe it! You know, Santa Claus historically comes from a ‘merge’ between Father Christmas and Sint Nikolaas, a saint the dutch settlers ‘brought in’. We still celebrate Sinterklaas over here, and I think this celebration comes a lot closer to a compact-y Santa Claus. It’s quite an interesting and fun read, if I may say so. We celebrate Hanukkah. We stopped giving presents to adults in the family years ago. My husband and I also don’t exchange gifts at that time of the year, since we haven’t had any extra money in so many years. Besides, we really do have everything we need. Our son (age 8) gets just one present per night of Hanukkah, so 8 total, mostly really small things and maybe 2 of them are blow-your-mind special Lego sets or whatever. (Those he gets from his grandmas!) He has 2 aunts, and a great uncle who send things, plus the grandmas = 5 gifts. So the most we ever buy are 3 small presents (usually books! ), sometimes someone will give him more than one present so we split those up and that counts as another night. He’s always overjoyed with whatever he gets, and always comments on how fun it is to get one thing per night, and play with that one thing and really enjoy it. Does he still have too many toys, compared to kids in other parts of the world? Of course. It’s a constant battle to get rid of things he’s done with or too old for. But he knows Hanukkah (and his birthday) are special times and he puts stuff on his “wishlist” all year long and that keeps him focused on waiting and saving. (Some stuff he ends up buying himself.) As he gets older, we’ll transition him away from expecting a present every night. We also always buy at least one thing off of a “giving tree” for a kid in need. He usually convinces me to buy for a 2nd kid, as well. His two older cousins celebrate Christmas and always received 15 – 20 presents each on Christmas morning, and they were so overwhelmed and focused on “what else is for me?” that they couldn’t even appreciate what they got. We’ve tried hard to keep our son away from thinking like that. 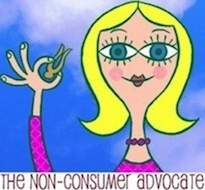 Previous post: Sustainable Living — Now in Handy Dandy Booklet Form!